Wonderful Ico Parisi attributed magazine table with angled legs and lots of space for books / magazines! Pair available - Priced individually. 3 tiered wicker and iron magazine table with craftsmanship attributed to Jacques Adnet. Fantastic magazine rack attributed to Jacques Adnet with bent iron and wicker. 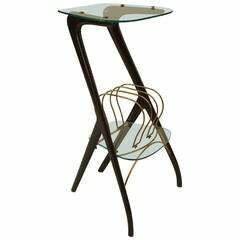 Jacques Adnet magazine table with magazine rack. 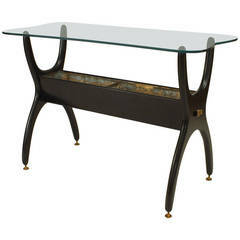 Black leather top, signature brass and black bamboo legs, with iron frame and brass corner detail. 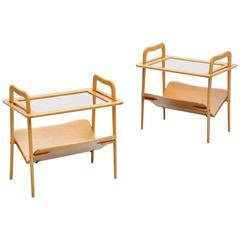 Unique Jacques Adnet table and magazine rack with iron frame and brown leather detailing with contrast stitching. Attributed to Ico Parisi, a 1940's Italian small end table with ebonized wooden sides supporting a glass top and shelf with a brass magazine rack. An Ico Parisi rosewood magazine rack side table with two clear glass shelves. Designed by Ico Parisi for Fratelli Rizzi, this mahogany and glass side table has all the flair and design quality that you'd expect from 1950s Italian design. 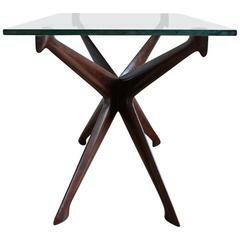 Mid century side table designed by Arthur Umanoff. This versatile piece is made of solid planked walnut and includes an attached magazine rack.